Having good ideas isn’t the hard part. The hard part is execution. 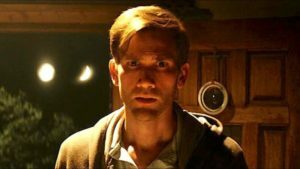 In The Endless, directors (and writer/stars) Justin Benson and Aaron Moorhead have a good idea. What if — this idea suggests — those crazy UFO cult people out in the desert have it right? Does everyone have their quarters for the space bus? Let’s go! 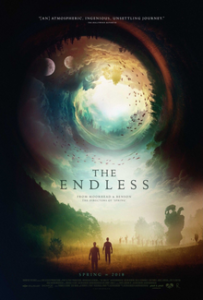 Told from the point of view of two brothers (also named Justin and Aaron) who escaped this maybe-cult and are now choosing to return, The Endless is a smoldering little low-budget neck crawler. Particularly in the beginning, when nothing is clear and things are not right. Not not right in the big budget, look-at-that-giant-CGI-monstrosity-eating-Vegas way, but in that wavering of time and space way that makes solid concepts slightly gelatinous and miasmic. People throw a rope out towards the moon, as one does in a crazy UFO desert death cult, and then they play a tug of war that the moon. Why? Does the moon win? Should it? What does it mean if the moon is stronger than you and what does it mean if you’re stronger than the moon? Shall we stay another night and find out? Unfortunately, the deeper Justin and Aaron get into the altered reality of the cult, the more Lost you get. And yeah, that’s capital “L” Lost, like the television show in which marvelous, compounding mysteries all add up to “it was a crazy dream!” and “mumble mumble river into somewhere.” So no, if you’re hoping that the spidery threads here will come together coherently or meaningfully — or even lead to a greater mystery — my news for you is disheartening. What is heartening, however, is the fact that The Endless is as good as it is, regardless. We can’t all be Shane Carruth and have our first film be Primer. Benson and Moorhead do a lot with not much. They’ve got a good idea, some friends who can act, and the tenacity to turn that into an honest-to-god movie. This is no small feat. And while one might have qualms about the logic of their story or their cinematographic choices, one has to admit that The Endless has some panache. It’s not flashy dreck. It’s honestly weird and I, for one, appreciate that. Given their success here — and shall we call The Endless a success? yes; let’s — it will be interesting to see what they can do with a bit more latitude and cash. Because clearly they have good ideas and aren’t afraid to execute. I felt they weren’t quite convincing playing brothers, that the rest of their cast looked a little too L.A., and that the ending to The Endless was perhaps its weakest link, but I also enjoyed watching it. If one thinks back to other hyped low-budget sci-fi/horror films — The Signal comes to mind — this one’s a gem. It has heart. It left me with a lot of unanswerable questions, but not in a way I found unfriendly. More like I’d had an exceptionally weird conversation with some rando at the bar and now I was trying to figure out where the lies started and what he actually believed. Now that I mull on it, The Endless reminds me of Evil Dead. A film that needed to be remade as Evil Dead II to really work, but without which Evil Dead II couldn’t exist. So you see? I’m suggesting Benson and Moorhead remake The Endless after they’ve let the concept bake a little longer. Or I’ve spent more time at the bar. I am. You’ve made the experience of watching this movie sound like hearing Hunter S. Thompson do a coffeehouse reading of Baudelaire: Bizarre, with moments of transcendence, and making the listener question her understanding of language, her sobriety, and the reader’s neurological function. What’s not to love? See you at the coffeehouse.